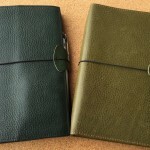 Anyone is welcome to take part in this series, it doesn’t matter if you own 1 or 101 travellers notebook covers. There will be five easy to answer questions and if you can also include some photographs for us to use that will be excellent. So if you would like to volunteer for this series please drop me an email: admin AT travellersnotebooktimes DOT com and I will send you a copy of the questions and the instructions.